You’re never too old for a bowl of jelly! 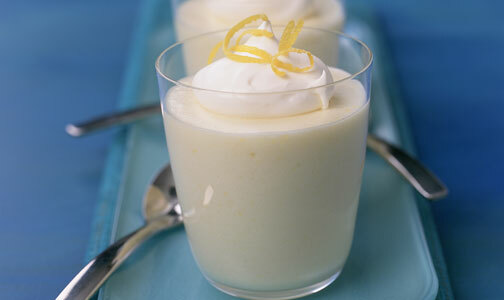 Enjoy a grown-up version with our quick and easy yoghurt jellies with whipped cream and lemon zest. They cost 72p each and take 3-4 hours to set, so there’s time for you to sit back and relax! 1. Place the gelatine in a bowl with a little cold water and leave for 5 mins until softened. 2. Heat the milk and sugar in a small pan until nearly boiling. Remove the gelatine from the water and shake off any excess. Add the gelatine to the milk and stir until dissolved. Whip the double cream until thickened. 3. Cool the milk in the pan over iced water in the sink, then whisk in the yogurt and vanilla. 4. Pour into individual glasses and set in the fridge for 3-4 hrs. Decorate with the whipped cream and lemon rind. Why not enjoy a cocktail alongside these yoghurt jellies?